By Allan Fox: Former heavyweight world title challenger Kubrat “The Cobra” Pulev (26-1, 13 KOs) will be looking to win his seventh straight fight this Saturday night on Top Rank Boxing in a 10 round fight against the recently knocked out Bogdan Dinu (18-1, 14 KOs) on ESPN/ESPN Deportes at The Hanger n Costa Mesa, California. The fight card starts at 10:00 p.m. ET/ 7:00 p.m. PT. Dinu, 32, was knocked out in the fourth round by Jarrell ‘Big Baby’ Miller last November. It’s a buzzkill for a lot of boxing fans that Pulev is facing a fighter that is coming off of a knockout loss to Jarrell Miller in his last fight. 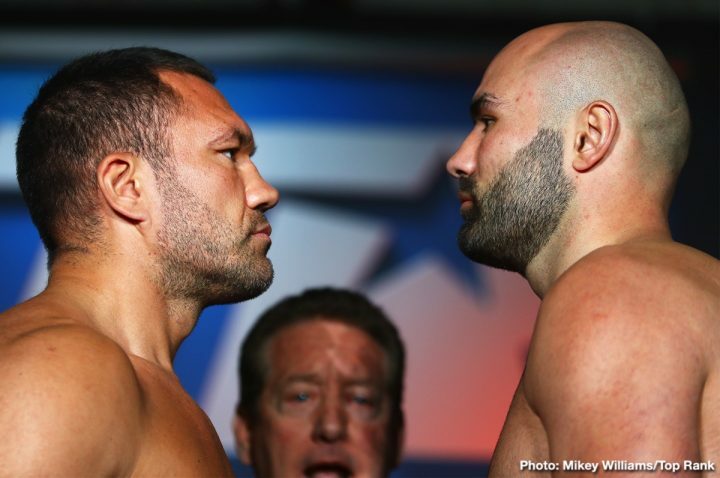 It’s hard for people to get excited at seeing Pulev face a guy that lost his last fight against the 315 pound Miller. Pulev, 37, recently signed a three-fight promotional deal with Top Rank Boxing, and they appear to be looking to slowly build him up in the same way that they’re doing with former heavyweight world champion Tyson Fury in matching him carefully against opposition that he can easily beat before putting him in with the likes of WBC heavyweight champion Deontay Wilder or IBF/WBA/WBO champion Anthony Joshua. Top Rank likely won’t match Pulev and Fury against each other, because there’s more money to be made by the promotional company by keeping them on separate paths for title shots against Joshua and/or Wilder. Pulev became Joshua’s World Boxing Organization mandatory challenger last October in easily beating Hughie Fury by a one-sided 12 round unanimous decision in a WBO title eliminator. There was nothing controversial about the decision. Pulev was simply too talented for Hughie, who looked as over-matched against him as he did in his loss to Joseph Parker. Pulev, 6’4 1/2″, is the WBO mandatory for Joshua. Pulev missed out on a title shot against Joshua in October 2017 when he suffered an injury a week before the fight, and had to pull out. Pulev was subsequently replaced by Carlos Takam, who was stopped in the 10th round by Joshua at the Principality Stadium in Cardiff, Wales. Pulev’s injury prevented him from getting a massive payday against Joshua. Pulev can’t afford to lose to the 6’5″ Romanian Dinu. A loss for Pulev will sink his chances of getting a fight with AJ. Top Rank has done their homework obviously, and they clearly see him as a guy that is beatable. They wouldn’t have made the Pulev-Dinu fight if they hadn’t fully vetted Dinu ahead of time to determine that he’s no threat to beating Pulev. The reason Pulev took the fight with Dinu was to stay sharp while he waits for his eventual title shot against Joshua. With Joshua’s popularity, there’s no telling how long Pulev will need to wait before he eventually gets a title shot against him. Although nicknamed, “The Cobra,” Pulev isn’t a big puncher. He’s more of a pure boxer, who jabs his opponents for 12 rounds to win decisions. Occasionally, Pulev will score a knockout by his jabs being too much for his opposition, but he’s never been able to knockout the high caliber heavyweights he’s faced in Wladimir Klitschko, Dereck Chisora and Tony Thompson. Klitschko stopped Pulev in the fifth round in 2014 in a one-sided fight. Pulev has won all six of his fights since the loss to Klitschko, beating Hughie Fury, Chisora, George Arias, Kevin Johnson, Samuel Peter and Maurice Harris. Pulev’s recent win over Chisora and Hughie showed that he’s still fighting at a high level, and can beat the fringe level heavyweights in the division if not the elite level guys. The fact is, we don’t know how good Pulev is because he’s not faced a talented heavyweight since his loss to Wladimir Klitschko in 2014. But rest assured, Pulev will do the job on Dinu on Saturday.